Mercer University Press: Walking Integrity : Benjamin Elijah Mays, Mentor to Martin Luther King Jr. 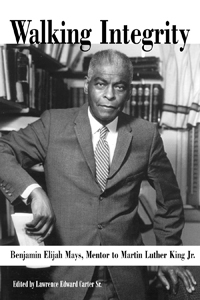 Walking Integrity : Benjamin Elijah Mays, Mentor to Martin Luther King Jr.
Edited by: Lawrence E. Carter, Sr.
Lawrence Edward Carter, Sr. has brought together in one volume eighteen essays that enunciate and celebrate Benjamin E. Mays's rarely equalled significance as an educator and minister in twentieth century America. Other essayists include Miles Mark Fisher, Mark L. Chapman, John Hope Franklin, Samuel DuBois Cook, Lerone Bennett, Jr., Charles Shelby Rooks, and others. This is most important volume on Martin Luther King's most important mentor.